Platelets, also called thrombocytes, are a component of blood whose function (along with the coagulation factors) is to stop bleeding by clumping and clotting blood vessel injuries. 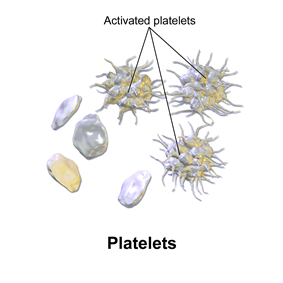 Platelets have no cell nucleus: they are fragments of cytoplasm which are derived from the megakaryocytes of the bone marrow, and then enter the circulation. These unactivated platelets are biconvex discoid (lens-shaped) structures, 2–3 µm in greatest diameter. 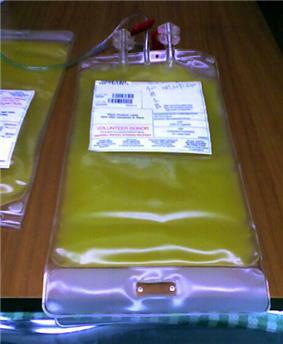 Platelets are found only in mammals, whereas in other animals (e.g. birds, amphibians) thrombocytes circulate as intact mononuclear cells. Michelson, Alan D. (2013). Platelets (3rd ed.). Academic. – 1351 pages; 60,000 references. Excerpts free online. ^ Laki K (Dec 8, 1972). "Our ancient heritage in blood clotting and some of its consequences". Annals of the New York Academy of Sciences 202: 297–307. ^ Machlus KR; Thon JN; Italiano JE (2014). "Interpreting the developmental dance of the megakaryocyte: A review of the cellular and molecular processes mediating platelet formation". British Journal of Haematology 165 (2): 227–36. ^ Jain NC (1975). "A scanning electron microscopic study of platelets of certain animal species". 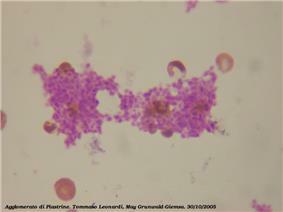 Thrombosis et diathesis haemorrhagica 33 (3): 501–7. ^ Paulus JM (1975). "Platelet size in man". Blood 46 (3): 321–36. ^ a b c Yip J; Shen Y; Berndt MC; Andrews RK (2005). "Primary platelet adhesion receptors". IUBMB Life (International Union of Biochemistry and Molecular Biology: Life) 57 (2): 103–8. ^ Beale LS (1864). "On the Germinal Matter of the Blood, with Remarks upon the Formation of Fibrin". Transactions of the Microscopical Society & Journal 12: 47. ^ Schultze M (1865). "Ein heizbarer Objecttisch und seine Verwendung bei Untersuchungen des Blutes". Arch Mikrosc Anat 1 (1): 1–42. ^ Bizzozero, J. (1882). "Über einen neuen Forrnbestandteil des Blutes und dessen Rolle bei der Thrombose und Blutgerinnung". Arch Pathol Anat Phys Klin Med 90 (2): 261–332. ^ Brewer DB (2006). "Max Schultze (1865), G. Bizzozero (1882) and the discovery of the platelet". Br. J. Haematol. 133 (3): 251–8. ^ Osler W (1886). "On certain problems in the physiology of the blood corpuscles". The Medical News 48: 421–5. ^ Wright JH (1906). "The Origin and Nature of the Blood Plates". The Boston Medical and Surgical Journal 154 (23): 643. ^ Wright JH. "The histogenesis of blood platelets". J Morphology year = 1910 21: 263–278. ^ Furie B; Furie BC (2008). "Mechanisms of thrombus formation". New England Journal of Medicine 359 (9): 938–49. ^ Girling JH (1962). "An automatic platelet counting technique". The Journal of medical laboratory technology 19: 168–73. ^ Ross DW; Ayscue LH; Watson J; Bentley SA (1988). "Stability of hematologic parameters in healthy subjects. Intraindividual versus interindividual variation". American journal of clinical pathology 90 (3): 262–7. ^ Ruocco L; Del Corso L; Romanelli AM; Deri D; et al. (2001). "New hematological indices in the healthy elderly". Minerva medica 92 (2): 69–73. ^ Lozano M; Narváez J; Faúndez A; Mazzara R; et al. (1998). "Platelet count and mean platelet volume in the Spanish population". Medicina clinica 110 (20): 774–7. ^ Murakawa M; Okamura T; Tsutsumi K; Tanoguchi S; et al. (1992). "Acquired von Willebrand's disease in association with essential thrombocythemia: Regression following treatment". Acta haematologica 87 (1–2): 83–7. ^ van Genderen PJ; Leenknegt H; Michiels JJ; Budde U (1996). "Acquired von Willebrand disease in myeloproliferative disorders". Leukemia and Lymphoma. 22 Suppl 1: 79–82. ^ Harker LA; Roskos LK; Marzec UM; Carter RA; et al. (April 2000). "Effects of megakaryocyte growth and development factor on platelet production, platelet life span, and platelet function in healthy human volunteers". Blood 95 (8): 2514–22. ^ Mason KD; Carpinelli MR; Fletcher JI; Collinge JE; et al. (2007). 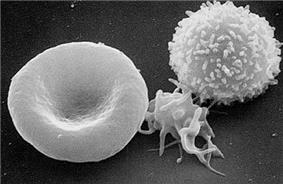 "Programmed anuclear cell death delimits platelet life span". Cell 128 (6): 1173–86. ^ Palmer RM; Ferrige AG; Moncada S (1987). "Nitric oxide release accounts for the biological activity of endothelium-derived relaxing factor". Nature 327 (6122): 524–6. ^ Jones CI; Barrett NE; Moraes LA; Gibbins JM; et al. (2012). "Endogenous inhibitory mechanisms and the regulation of platelet function". Methods Mol. Biol. 788: 341–66. ^ Marcus AJ; Broekman MJ; Drosopoulos JH; Olson KE; et al. (2005). "Role of CD39 (NTPDase-1) in thromboregulation, cerebroprotection, and cardioprotection". Seminars in Thrombosis and Hemostasis 31 (2): 234–46. ^ Dubois C; Panicot-Dubois L; Merrill-Skoloff G; Furie B; et al. (May 2006). "Glycoprotein VI-dependent and -independent pathways of thrombus formation in vivo". Blood 107 (10): 3902–6. ^ a b Yip J; Shen Y; Berndt MC; Andrews RK (2005). "Primary platelet adhesion receptors". IUBMB Life 57 (2): 103–8. ^ Matarrese P; Straface E; Palumbo G; Anselmi M; et al. (2009). "Mitochondria regulate platelet metamorphosis induced by opsonized zymosan A—activation and long-term commitment to cell death". FEBS Journal 276 (3): 845–56. ^ Behnke O (1970). "The morphology of blood platelet membrane systems". Series haematologica 3 (4): 3–16. ^ Phillips DR; Charo IF; Scarborough RM (May 1991). "GPIIb-IIIa: the responsive integrin". Cell 65 (3): 359–62. ^ Coller BS; Cheresh DA; Asch E; Seligsohn U (1991). "Platelet vitronectin receptor expression differentiates Iraqi-Jewish from Arab patients with Glanzmann thrombasthenia in Israel". Blood 77 (1): 75–83. ^ Movat HZ; Weiser WJ; Glynn MF; Mustard JF (1965). "Platelet phagocytosis and aggregation". J. 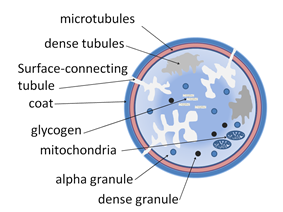 Cell Biol. 27 (3): 531–43. ^ a b Bouchard BA; Mann KG; Butenas S (August 2010). "No evidence for tissue factor on platelets". Blood 116 (5): 854–5. ^ Ahmad SS; Rawala-Sheikh R; Walsh PN (1992). "Components and assembly of the factor X activating complex". Semin. Thromb. Hemost. 18 (3): 311–23. ^ Weyrich AS; Zimmerman GA (2004). 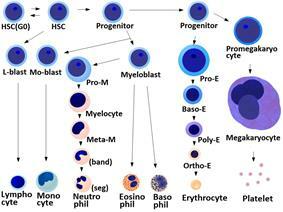 "Platelets: signaling cells in the immune continuum". Trends Immunol. 25 (9): 489–95. ^ Wagner DD; Burger PC (2003). "Platelets in inflammation and thrombosis". Arterioscler. Thromb. Vasc. Biol. 23 (12): 2131–7. ^ Diacovo TG; Puri KD; Warnock RA; Springer TA; et al. (1996). "Platelet-mediated lymphocyte delivery to high endothelial venules". Science 273 (5272): 252–5. ^ Iannacone M; Sitia G; Isogawa M; Marchese P; et al. (2005). "Platelets mediate cytotoxic T lymphocyte-induced liver damage". Nat. Med. 11 (11): 1167–9. ^ Iannacone M; Sitia G; Isogawa M; Marchese P; et al. (2005). "Platelets mediate cytotoxic T lymphocyte-induced liver damage". Nat Med 11 (11): 1167–9. ^ Schmaier AA; Stalker TJ; Runge JJ; Lee D; et al. (September 2011). "Occlusive thrombi arise in mammals but not birds in response to arterial injury: evolutionary insight into human cardiovascular disease". Blood 118 (13): 3661–9. ^ Belamarich FA; Shepro D; Kien M (November 1968). "ADP is not involved in thrombin-induced aggregation of thrombocytes of a non-mammalian vertebrate". Nature 220 (5166): 509–10. ^ Duke WW (1910). "The relation of blood platelets to hemorrhagic disease". JAMA 55: 1185–92. ^ Geddis, AE (Feb 2013). "Inherited thrombocytopenias: an approach to diagnosis and management". International journal of laboratory hematology 35 (1): 14–25. ^ Kornerup KN; Page CP (2007). "The role of platelets in the pathophysiology of asthma". Platelets 18 (5): 319–28. ^ Laidlaw TM; Kidder MS; Bhattacharyya N; Xing W; et al. (2012). "Cysteinyl leukotriene overproduction in aspirin-exacerbated respiratory disease is driven by platelet-adherent leukocytes". Blood 119 (16): 3790–8. ^ Erpenbeck L; Schön MP (2010). "Deadly allies: the fatal interplay between platelets and metastasizing cancer cells". Blood 115 (17): 3427–36. ^ Pleass RJ (2009). "Platelet power: sticky problems for sticky parasites?". Trends Parasitol. 25 (7): 296–9. ^ "Platelet Function after Taking Ibuprofen for 1 Week". Annals of internal medicine 142 (7): I54. 2005. ^ Rao GH; Johnson GG; Reddy KR; White JG (1983). "Ibuprofen protects platelet cyclooxygenase from irreversible inhibition by aspirin". Arteriosclerosis 3 (4): 383–8. ^ van Veen JJ; Nokes TJ; Makris M (2010). "The risk of spinal haematoma following neuraxial anaesthesia or lumbar puncture in thrombocytopenic individuals". Br. J. Haematol. 148 (1): 15–25. ^ Roback, J.; Grossman, B.; Harris, T.; Hillyer, C., eds. (2011). Technical Manual (17th ed.). Bethesda MD: AABB. p. 580. ^ Högman CF (1992). "New trends in the preparation and storage of platelets". Transfusion 32 (1): 3–6. ^ Ruane PH; Edrich R; Gampp D; Keil SD; et al. (2004). "Photochemical inactivation of selected viruses and bacteria in platelet concentrates using riboflavin and light". Transfusion 44 (6): 877–85. ^ Perez-Pujol S; Tonda R; Lozano M; Fuste B; et al. (2005). "Effects of a new pathogen-reduction technology (Mirasol PRT) on functional aspects of platelet concentrates". Transfusion 45 (6): 911–9. ^ Schoenfeld H; Spies C; Jakob C (2006). "Volume-reduced platelet concentrates". Curr. Hematol. Rep. 5 (1): 82–8. ^ Gawaz M; Vogel S (October 2013). "Platelets in tissue repair: control of apoptosis and interactions with regenerative cells". Blood 122 (15): 2550–4. Platelet concentration is measured either manually using a hemocytometer, or by placing blood in an automated platelet analyzer using electrical impedance, such as a Coulter counter. The normal range (99% of population analyzed) for platelets in healthy Caucasians is 150,000 to 400,000 per cubic millimeter  (a mm3 equals a microliter). or 150–400 × 109 per liter. The normal range has been confirmed to be the same in the elderly and Spanish populations. Men as a group have slightly higher mean values than women.